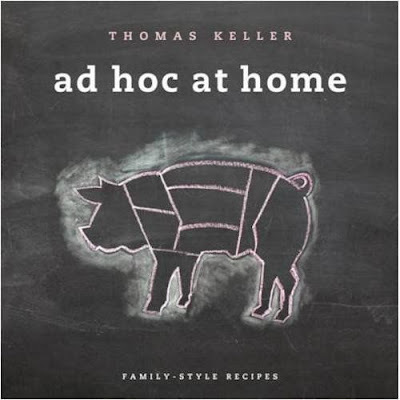 A few weeks ago, I picked up a copy of Thomas Keller’s Ad Hoc at Home. I settled onto the couch and strategically balanced the oversized, very heavy book on my lap. By the time I had finished flipping through its pages, not only were my thighs numb, I already had accumulated about a half dozen recipes that I wanted to try. Did I expect anything less? Probably not. How is this any different, you may ask, than any other new cookbook acquisition? 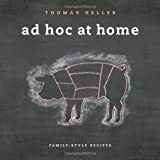 Consider this – while other cookbooks may give me collections of recipes that I’d like to try, thumbing through Ad Hoc at Home has managed to actually change the way that I think about cooking. 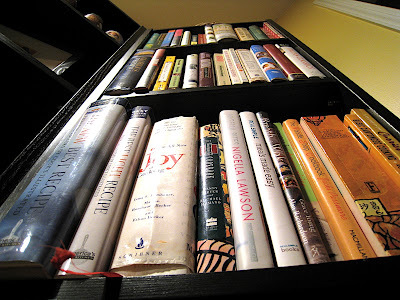 If you’ve ever seen the dozens of cookbooks that occupy their own Billy bookcase (and half of a second one) in our library, you would know that this is no small feat. I’ve gone from collecting recipes to collecting techniques, and Ad Hoc at Home is a treasure trove. One of the first recipes that I tried out of Ad Hoc at Home was actually listed as an ingredient for another dish that I wanted to make. The soffritto, which is one of the components of a roasted pepper recipe, calls for only three primary ingredients – spanish onions, plum tomatoes, and olive oil – plus one minced clove of garlic at the end. Easy enough, right? And yet, the actual recipe itself, when done in accordance with Keller’s instructions, takes five hours from start to completion. From a process perspective, nothing could be simpler than this soffritto. Just chop the onions, toss them into a pan with a generous amount of olive oil, then simmer away for 2 1/2 hours. At that point, create a tomato pulp by stroking the cut plum tomatoes against a grater, add that to the onions, and simmer for another 2 1/2 hours. One pressed clove of garlic finishes the dish. You would think that such a simple recipe would yield standard results – a sweet caramelized onion flavor, some acidity from the tomatoes, but nothing fantastic, right? This is where the magic of Keller’s technique shines – the resulting soffritto has such a depth of flavor, it’s tempting to just break out a spoon and eat it straight from the pot, thereby nullifying five hours worth of toil for five minutes of pleasure. The overall experience is a subtle shift in perception, a quiet realization that, if treated with enough care and attention, even the humblest of ingredients can surprise you. I used the soffritto in the roasted peppers, then gradually depleted the rest of the batch by stirring it into scrambled eggs and folding a spoon of it into a batch of home fries. My one admission is this – I didn’t carry the recipe through to its full five hour preparation time. It’s not that I didn’t want to, it’s that I was forced to end it early after realizing that the soffritto was browning way too quickly. My burners were not designed to sustain such a low simmer as what Keller’s recipe demands, and I was forced to take the soffritto off of the heat to save it from turning into a charred mess. So, as soon as I get my hands on a flame tamer, I’m going to tackle this recipe again, and do it right the next time. As good as the soffritto was after three hours, I can only begin to imagine how it will taste after five. And one day, I may just find myself in Yountville, sitting down to taste the original. For some people, it’s shoes. For others, it’s consumer electronics. For me, the object of my collection obsession, as it has been for a number of years, has been the cookbook. You may have noticed that, so far, a lot of the recipes that have appeared on The Best Food Blog Ever have been sourced from cookbooks and culinary magazines, and this is by design. I am approaching the development of this blog much like the evolution of my own skills in the kitchen. At first, you prepare recipes exactly as they are presented in a cookbook, to the letter, and as someone new to the kitchen, you fear any variation lest you “mess up” the final dish. Then, one day, you really want to make a particular recipe and you find out that you’re missing one small ingredient – and you substitute, and it works. Then you do this more and more, and one day, you’re using the cookbooks and recipes as launching points, taking an idea here, a technique there, and making your own creations based on tried-and-true past experiences. That’s my rationale for having so many cookbooks. Quite a few of them are good for only a handful of recipes, but they are solid, dependable recipes that will always work. Others, like the Joy of Cooking and The New Basics, are the go-to books for master recipes covering a broad range of different ingredients and techniques. Still others form the basis for my core knowledge of ethnic cuisine, and I try to limit myself to the “best of the best” for a certain nationality, but someone’s always writing a better one that will be published one day, and that will invariably end up in my bookcase. The oldest cookbook that I own was probably picked up when I was fifteen, and the most recent was likely found at an outlet store for a killer price. I used to avoid books that had a lot of fancy photography and advanced layout (I still have a small collection of Frugal Gourmet paperbacks) but in today’s modern times that’s all we seem to get, and I don’t mind the shift. I’ve come to realize that food photography can go a long way towards illustrating what a dish is supposed to look like, and without it, you’ve lost an important barometer of how well you’re executing a dish. Perhaps the best part about finally buying a house was being able to display all of my cookbooks in one place, as opposed to having random stacks of them on the floor in our old apartment. Well, that, and the larger kitchen.